Dr. Aditya, a renowned practitioner of Homeopathy, is being interviewed live on television. The interview highlights Dr. Aditya’s unique achievements – 30 years of practice, the establishment of India’s first purely homeopathic hospital and care center, operating the center successfully for over 16 years, the treatment of various acute and chronic diseases and emergency medical conditions without resorting to operations or even injections. Dr. Aditya is hailed as a pioneer and revolutionary path breaker in medicine when a phone call interrupts the show. The caller asks a simple question of Dr. Aditya, "But what about my wife?" The caller reveals that his wife is undergoing treatment in Dr. Aditya’s hospital. He accuses the doctor of not doing anything for his wife who is afflicted by a motor–neuron disease. The caller charges the doctor of falsifying information, making tall claims about his abilities and Homeopathy and then makes a telling comment, "Homeopathy is a fake science." The TV interview ends in a furore. The TV channel, finding the sensational call had boosted its TRPs sky high, vows to follow up on the story. The channel promises to get Dr. Aditya back on the next show to answer the allegations levelled against him. The accuser meanwhile calls in the media. Reporters rush to the hospital and over the next few days the media frenzy excavates every bit of Dr. Aditya’s life and Homeopathic medicine. The law takes a note of the media reports and the police decide to investigate Dr. Aditya and his hospital. What does she find there? Who is the person who has so sensationally accused Dr. Aditya? What are the motivations behind that accusation? Is Dr. Aditya a fraud? Is his hospital a farce? Is Homeopathy, really a fake science? Meanwhile the time to the next television show is approaching fast. What will be the result of this investigation? Will it destroy Dr. Aditya? Or will it vindicate him? Will Dr. Aditya’s hospital and Homeopathy regain their credibility? Pratisaad’s story is inspired by true real–life experiences of Dr. Amarsinha D. Nikam who practices Homeopathy in Pimpri on the fringes of Pune. Dr. Nikam opened the first purely homeopathic hospital in India in Pimpri. Aditya Homeopathic Hospital uses classical Homeopathy to treat chronic diseases and critical patients from all over India. Dr. Nikam has been practicing Homeopathy and helping ‘incurable’ patients for over 30 years. Pratisaad is Dr. Nikam’s attempt to enlighten and educate the masses the truth about Homeopathy. 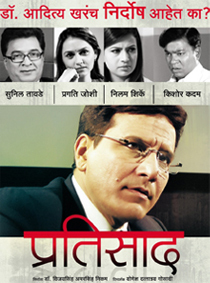 Pratisaad, incidentally, is the first ever film with Homeopathy as a subject.